Seven teams in two flights competed on Saturday August 3 in a 10 & Under Co-Ed Team Tournament hosted by USTA Central Arizona held at the Phoenician Resort. The courts were packed with siblings, parents, coaches and players cheering each other on and having fun playing tennis. Flight 1 consisted of teams from Surprise Tennis and Racquet Center, Scottsdale Athletic Club and Gold Key Racquet Club. Flight 2 consisted of teams from Ahwakutee Tennis Club, Kiwanis Center, Arrowhead Country Club and the Phoenician. Before tournament play started, two Phoenician pros hosted a half hour clinic with players who had registered for the tournament early. The kids drilled and played doubles games to warm up. Match play started at 6 p.m. and lasted just over three and a half hours, with the winners of each flight being determined by total number of games won. In Flight 1, Team Miyata from Scottsdale Athletic Club emerged victorious. At the end of play, Team Miyata and Team Surprise were tied at 13 games. To decide the winner, the teams played a super tiebreaker of boys doubles. Team Miyata pulled out the back-and-forth breaker, taking the top prize. In a moment of true sportsmanship, the members of Team Surprise who were watching on the sidelines rushed the court to hug their teammates. Even though Team Surprise lost, they were all smiles. Flight 2 came down to Team Ahwatukee vs. Team Kiwanis. Team Ahwakutee was up by three games going into the last match. Team Kiwanis won one court of doubles and tied 3-3 with Team Ahwatukee at another. Team Ahwatukee rallied back with two 4-0 singles wins to pull ahead and take the victory. At the end of play, a raffle concluded the event. Kids packed the tournament desk to hear the winning numbers announced. Players took home prizes including frisbees, water bottles, light-up bouncy balls, drawstring backpacks and more. Both first and second place teams took home medals, as well as certificates. 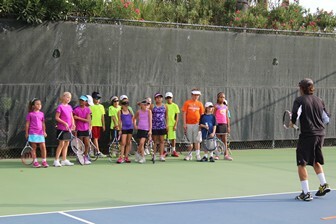 The tournament was played in the 10 & under format, which consists of 60' courts and an orange ball. There were four rounds, lasting 20 minutes each. USTA Central Arizona is currently planning two or three more team events for the fall. Dates and locations TBD. Check our newsletter for more updates. To view all photo galleries of the tournament, click here. To view all player and team photos, check out our Facebook page.